"When you need Divine guidance, turn to the beloved saints and angels. 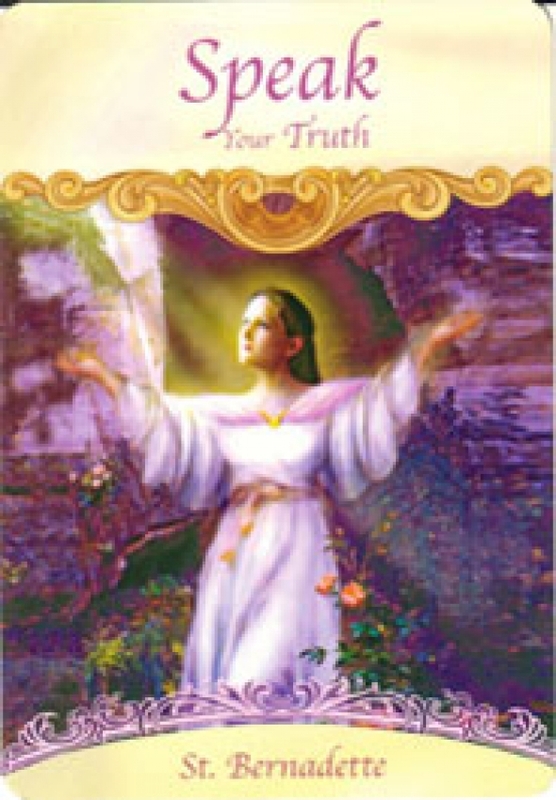 The gorgeous artwork and loving words on these nondenominational oracle cards provide you with a trustworthy way to access messages from above. Receive comfort from beloved saints such as Fracis, Catherine, Anthony, Hildegard, Teresa, Joan of Arc and Bernadette, as well as powerful angels and archangels. There's also guidance from God, the Holy Spirit, and Christ. Whether you're new to the spiritual path or a seasoned believer, you'll find that the safe and loving messages in these cards will help you know that Heaven's help is always readily available, and that you're never alone. St. Mother Theresa - encourages philanthropy and championing for a cause; God - message of love; St. Mary Magdalane - offers a message of forgiveness. There are also cards representing messages from your very own guardian angel that you may have called on before and during one of four spreads as detailed in the 109 page guidebook. Such spreads include the 3 card spread and other forms of communicating with your spirit guide(s) or guardian angel(s). Doreen bestows to the reader her way of cleansing the deck before use to rid negative and/or previous energy from an earlier reading by rapping on the cards with assistance from a prayer. My experience using this deck has been serene as some of the illustrations are gorgeous or transcendental such as the Mother Teresa "Activist", "Speak Your Truth" of St. Bernadette, or the "Steady Progress" card of St. Therese of Lisieux done by Marius Michael George or the "Wise Decision " card from your Guardian Angel by Elizabeth Kyle. Despite the beautiful illustrations, shuffling the cards were a little cumbersome if one is not acquainted with the slightly-than-larger playing card size of deck. My initial reading and interpretation of the cards or what they were communicating was quite vague, which made me questioned why I did not stick with the traditional Tarot card series I saw. From my confusion I actually used a regular deck of playing cards to aide me in questions. I even considered my difficulty with the deck being attributed to my lack of familiarity with Saints and or Catholicism. However, due to the cards being quite beautifully done, I did not want to discard or give up on them just yet. I decided to do what some who are more familiar with cartomacy would never do, do a reading with two different decks in order to answer any one question. After doing this, I had discovered I had more faith in Doreen's deck than before and I also understood an important theme in Doreen's cards. In my readings I would inquire about work and also about other general questions regarding the universe and what I may need to know for today. Doreen insists for people to keep a journal of their readings as a way to further develop an understanding of the deck. In my spiritual and universal questions about life and religion the cards that were shown to me were direct as I was shown Animals, Marriage, and Love (God). At first I thought it was the luck of the draw but in revealing that my question was about why do we as humans live, I found it to be quite profound as in the Bible it speaks of the creation with plants, animals, the marriage of Adam and Eve and God's part in it. Many times I was presented with the "Child" card and was thrown off by this card as many times it would surface. Just recently I learned that my sister is 4 months with child. As far as work issues, I would often turn over the "You're a Leader" card of Joan de Arc, or the "Learning Experience" card,"Reward" and "Practice Makes P erfect" cards from my guardian angel(s). All of these cards made perfect sense as I was seeking guidance to a position I had applied for as a promotion within my job's network. I did receive my reward through some study of the skill required in order to answer many questions on the interview correctly. I was offered the position. Though the cards can seem ambiguous and esoteric, they are uncannily accurate once you get to know and understand them. My trial phase of using a regular playing card deck along with Doreen's deck to divine answers may also be necessary for others to learn the language and sophistication of the deck. While the Tarot card or a regular deck of playing cards are more direct, literal, and suggestive in their messages, they often present too much ill-fated information which comes across as quite doom and gloom. Though these traditional cards of cartomacy were more accurate in my reading, they often gave me little to no hope. Doreen's deck gave you another perspective of the many realms of life forces and energies of which we live with, her cards presented to me the other side of the coin with my inquiries as they were very inspirational and were better for my psychological well being than a traditional deck. Doreen's deck reminds us that with the help of our Saints, Angels, and a positive attitude, we can often alter the mood of the situation we are in either in ways for us to cope with our burdens better or to offer guidance in way of emerging as the victor. If one prefers the details in a reading pertaining to work or many earthly things, I would suggest using some of Doreen's other decks or a traditional Tarot deck. However, if you have questions about life, love, and would like gentle daily guidance, I would suggest for people to take advantage of this deck.